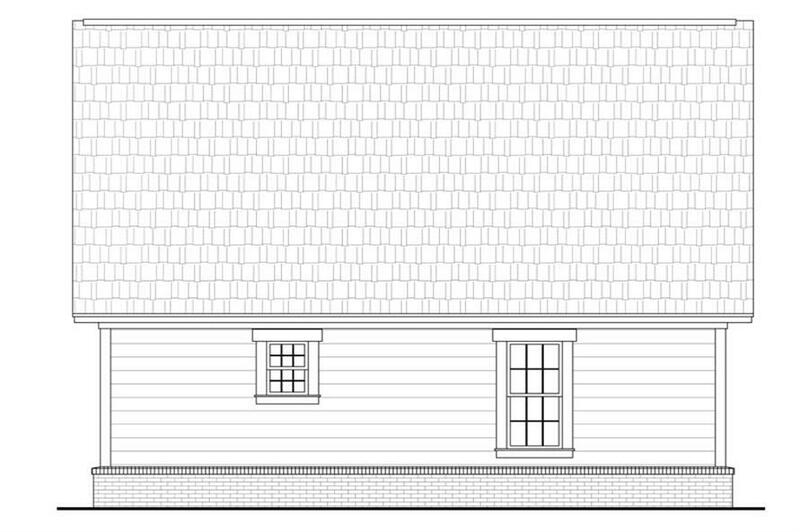 Home Plan: #142-1032 Front elevation rendering of Country Home plan 142-1032. 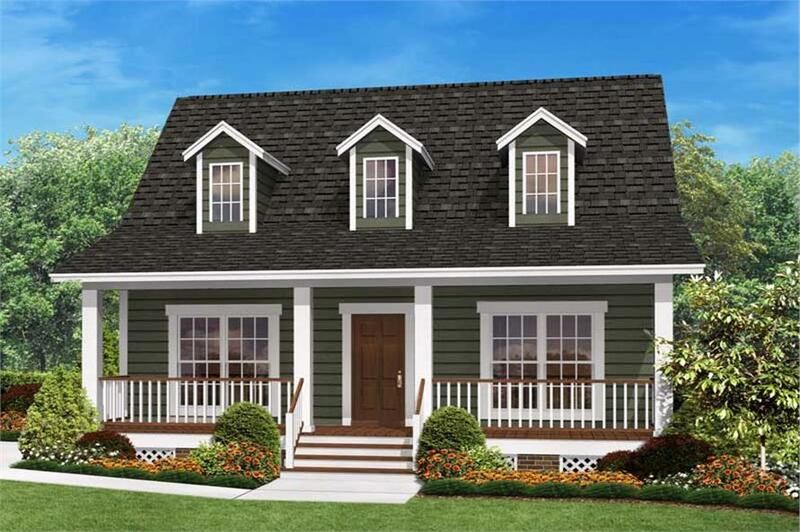 Conjuring up a dream home even in a restrained footprint, this small Country house plan with Cape Cod influences is ideal for holidays or everyday use. Its clean, bold, and uncluttered design allows for grand impressions and functional efficiency, with built-in storage keeping things working at all times. The covered full-width front porch – ideal for get-togethers and lazy evenings – opens up into the shared social space of the home. Incorporating the living room, kitchen, and dining room in a cool and versatile open-plan format, the space stretches across the width of the home plan, keeping social banter to the front of the house. The latter half of the floor plan is dedicated to more private or functional spaces. The open social core narrows into a hallway containing the laundry room and linen closet, as well as offering access to the common bathroom shared by residents and guests alike. The two bedrooms lie on either side, with the larger master bedroom afforded its own attached bathroom. Both bedrooms come with private walk-in closets that help fit all your aesthetic and functional demands into this house plan without overwhelming it. Would like to add 8 feet to the width, with this space you could have a hall also adding a rear entry and reworking the laundry area making the total square feet of house 1188sf. I would take the dog house dormers away and make one large shed dormer, this would safe costs. I would try to work in permanent steps to attic space from the hall area. With adding the extra square feet you could add more storage and make one bathroom bigger.In the living room I would add a fireplace. It also would be nice to have a way to a breeze way to the left side of house to attach a garage.